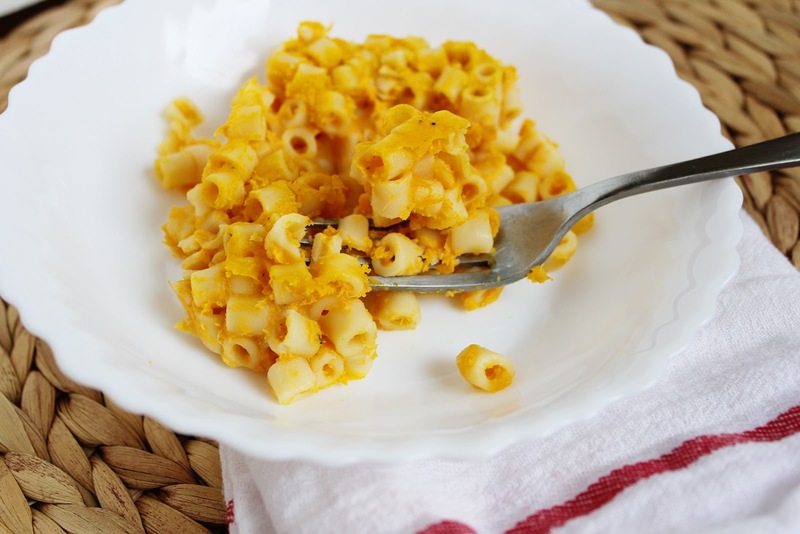 Butternut Squash Mac ‘n Cheese is a the perfect solution for getting your picky eaters to finish their veggies! I love mac ‘n cheese, but who doesn’t for that matter? Our daughter is quite the fan as well and since I like to make things as healthy as possible for her, since she has always been a good eater of a wide variety of foods. She even likes avocado, which I can’t stand! So I have been feeding her as many different kinds of fruits and vegetables in hopes of avoiding the “terrible toddler phase” of chicken nuggets and goldfish. This recipe is a great way to get picky eaters or anyone in general to finish their mac n’ cheese and what I like best about it is the rich golden color that makes it look the same as traditional. When I am feeling lazy or when squash isn’t in season, I like to buy the Birdseye frozen box, it really cuts down on the prep time. For a creamy, tasty and healthier twist on your regular mac ‘n cheese – I suggest you give this recipe a try. It makes a great side dish, but I’ll admit I have been known to eat it cold for breakfast, enjoy and happy baking! Preheat your oven to 350º and spray an 8"x8" baking pan, set aside. Cook the pasta and squash according to package instructions, drain the pasta and stir in the squash, cheese, milk and salt and pepper. Once the mixture is smooth and creamy, spread the mac n' cheese into the pan and bake for 30 minutes, until golden and crispy on top. Cool 5 minutes and serve. what is a box of butternut squash? Oh!!! I must try this! I just adore butternut squash.. I would have never thought of including it in mac-n-cheese! OH Wow this recipe sounds amazing. I am going to try it out. Actually sounds like a GREAT way to get those veggies in! I am going to try this! Happy SITS day!